The Advanced Institute for Globalization and Culture (aig+c) and Definitely Superior Art Gallery, are hosting a gala opening and E-Book Launch for Superior Art: Local Art in a Global Context edited by Clara Sacchetti, Kezia Picard, Mark Nisenholt, and Todd Dufresne. Superior Art began with the recognition that there is excellent art made within, and about, Thunder Bay. 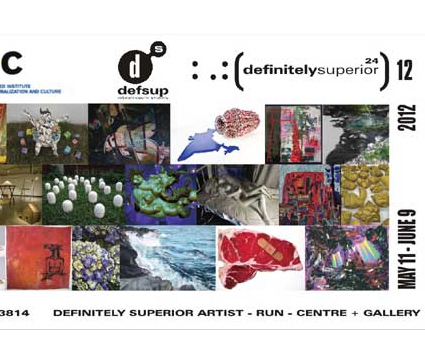 Indeed, Superior Art showcases 21 diverse and accomplished artists: Oliver Reimer, Marianne Kyryluk, Kasia Piech, Duncan Weller, Ann Clarke, Quentin Maki, Julie Cosgrove, Guy Dufresne, Patrick Doyle, Linda Dell, Mark Nisenholt, Ryan Slivchak, Sam Shahsahabi, Elizabeth Buset, Sarah Link, Roland Martin, Christian Chapman, Chris Stones, Alison Kendall, Luke Nicol, and Mavourneen Trainor. The E-Book will be projected via slide presentation on the large screen for all to see. Artists in attendance. Music by Rory Bohler along with a bevy of fresh spring refreshments provided by Sweet Pea Home Catering & Restaurant .